Damaging Your Hair in The Name of Style? So What. Introducing NEW Dove Damage Therapy; a reassuring range that helps takes care of hair damage, leaving you to enjoy your favourite styles, guilt free and without the worry of damage. The new range is formulated with a Micro Moisture Serum to work on the tiniest chips and cracks on the hair's surface and patented Fibre Active technology that identifies areas of damage and penetrates deeper into the hair shaft in order to restore and strengthen it from the inside out. In fact, the breakthrough combination helps to internally restore hair and prevent breakage for up to 95% fewer split ends. The range comes in sleek, white packaging and features five shampoos and conditioners designed to care for different types and levels of damage - Intensive Repair, Colour Care, Dry Repair, Heat Defence and Daily Moisture - as well as two Daily Treatment Conditioners and a Heat Defence Mist. New to the range is Dove Damage Therapy Overnight Treatment, which delivers one month's worth of protein loss in just one night, helping to restore hair strength and resilience while you sleep. While many shampoos and conditioners are designed to work on the surface - filling in the small chips in the cuticle to help leave hair feeling smooth and shiny - damaged hair may need more. Fibre Actives are small molecules that provide surface and internal repair. They penetrate porous hair to restore bonds between proteins in order to help the hair regain its original structural integrity. The result? Hair is left strong, repaired and resilient to future damage. Fibre Actives are found in Dove Damage Therapy Intensive Repair Shampoo and Conditioner, Overnight Treatment and also Daily Treatment Conditioner - Intensive Repair. The Micro Moisture Serum consists of millions of tiny conditioning droplets which spread across the hair surface to fill in the cracks and chips in the hardest-to-reach areas of damage, so the hair shaft can be repaired evenly, leaving hair feeling smooth, natural and light. Ruth Muller, Research & Development - Dove, said: "Following two years of product development, we developed the breakthrough Fibre Active technology to penetrate the hair shaft and strengthen strands from deep within. It's a lightweight formulation that doesn't just work on surface damage, like many other products on the market, but also helps restore and strengthen hair from the inside out." Night time provides the perfect opportunity to intensely revive your hair from within while you sleep. Contains Fibre Actives to deeply penetrate damaged hair throughout the night to actively replenish proteins and restore strength. Features a Micro Moisture Serum to nourish and seal each hair strand from root to tip. Hair can be damaged on the inside and outside, making it weak, porous and more prone to breakage. Features a patented Micro Moisture Serum to nourish hair from root to tip and seal lifted cuticles to help protect against future damage. Colouring can cause damage to hair and damaged hair struggles to retain colour. An intense repairing conditioner for extra damaged hair. When hair is damaged, it can lose its moisture everyday. That's why it feels rough and dry with uncontrollable fly-aways and static. An intense nourishing conditioner for extra dry hair. Heat styling appliances can reach 180°C and damage essential proteins in the hair. A lightweight heat activated mist to help defend the internal structure of hair from the damaging effects of blow dryers, flat irons & curling irons. Daily wear and tear can cause early signs of damage, leaving healthy hair vulnerable, dry and dull if unprotected. 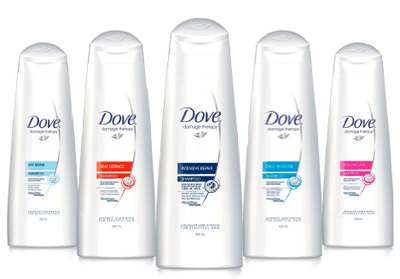 Protect your tresses with NEW Dove Damage Therapy, available in supermarkets nationwide.